November 1951 nuclear test at Nevada Test Site. Test is shot "Dog" from Operation Buster, with a yield of 21 kilotons of TNT (88 TJ). It was the first U.S. nuclear field exercise conducted with live troops maneuvering on land. Troops shown are 6 mi (9.7 km) from the blast. 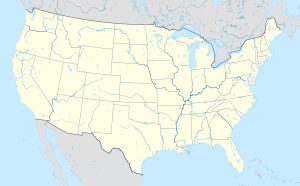 The Nevada National Security Site (N2S2 or NNSS), previously the Nevada Test Site (NTS), is a United States Department of Energy reservation located in southeastern Nye County, Nevada, about 65 miles (105 km) northwest of the city of Las Vegas. Formerly known as the Nevada Proving Grounds, the site was established on January 11, 1951 for the testing of nuclear devices, covering approximately 1,360 square miles (3,500 km2) of desert and mountainous terrain. Nuclear weapons testing at the Nevada Test Site began with a 1-kiloton-of-TNT (4.2 TJ) bomb dropped on Frenchman Flat on January 27, 1951. Many of the iconic images of the nuclear era come from the NTS. NNSS is operated by Mission Support and Test Services, LLC. During the 1950s, the mushroom clouds from the 100 atmospheric tests could be seen for almost 100 mi (160 km). The city of Las Vegas experienced noticeable seismic effects, and the distant mushroom clouds, which could be seen from the downtown hotels, became tourist attractions. St. George, Utah, received the brunt of the fallout of above-ground nuclear testing in the Yucca Flats/Nevada Test Site. Westerly winds routinely carried the fallout of these tests directly through St. George and southern Utah. Marked increases in cancers, such as leukemia, lymphoma, thyroid cancer, breast cancer, melanoma, bone cancer, brain tumors, and gastrointestinal tract cancers, were reported from the mid-1950s through 1980. A further 921 nuclear tests were carried out underground. From 1986 through 1994, two years after the United States put a hold on full-scale nuclear weapons testing, 536 anti-nuclear protests were held at the Nevada Test Site involving 37,488 participants and 15,740 arrests, according to government records. Those arrested included the astronomer Carl Sagan, musician Kris Kristofferson, and the actors Martin Sheen and Robert Blake. The Nevada Test Site was established as a 680-square-mile (1,800 km2) area by President Harry S. Truman on December 18, 1950, within the Nellis Air Force Gunnery and Bombing Range. The Nevada Test Site was the primary testing location of American nuclear devices from 1951 to 1992; 928 announced nuclear tests occurred there. Of those, 828 were underground. (Sixty-two of the underground tests included multiple, simultaneous nuclear detonations, adding 93 detonations and bringing the total number of NTS nuclear detonations to 1,021, of which 921 were underground.) The site is covered with subsidence craters from the testing. The NTS was the United States' primary location for tests in the 500-to-1,000 kt (2,100-to-4,200 TJ) range. 126 tests were conducted elsewhere, including most larger tests. Many of these occurred at the Pacific Proving Grounds in the Marshall Islands. During the 1950s, the mushroom clouds from atmospheric tests could be seen for almost 100 mi (160 km). The city of Las Vegas experienced noticeable seismic effects, and the distant mushroom clouds, which could be seen from the downtown hotels, became tourist attractions. The last atmospheric test detonation at the Nevada Test Site was "Little Feller I" of Operation Sunbeam, on July 17, 1962. Although the United States did not ratify the Comprehensive Nuclear-Test-Ban Treaty, it honors the articles of the treaty, and underground testing of weapons ended as of September 23, 1992. Subcritical tests not involving a critical mass continued. One notable test shot was the "Sedan" shot of Operation Storax on July 6, 1962, a 104-kiloton-of-TNT (440 TJ) shot for Operation Plowshare, which sought to prove that nuclear weapons could be used for peaceful means in creating bays or canals. It created a crater 1,280 feet (390 m) wide and 320 feet (100 m) deep that can still be seen today. The site was scheduled to be used to conduct the testing of a 1,100-ton conventional explosive in an operation known as Divine Strake in June 2006. The bomb is a possible alternative to nuclear bunker busters. After objections from Nevada and Utah's members of Congress, the operation was postponed until 2007. On February 22, 2007, the Defense Threat Reduction Agency (DTRA) officially canceled the experiment. On December 7, 2012 the most-recent explosion was conducted, an underground sub-critical test of the properties of plutonium. Testing of the various effects of detonation of nuclear weapons was carried out during above-ground tests. Many kinds of vehicles (ranging from cars to aircraft), nuclear-fallout and standard bomb-shelters, public-utility stations and other building structures and equipment were placed at measured distances away from "ground zero", the spot on the surface immediately under or over the center of the blast. Operation Cue tested civil defense measures. Such civilian and commercial effects testing was done with many of the atomic tests of Operation Greenhouse on Eniwetok Atoll, Operation Upshot-Knothole and Operation Teapot at the NTS. Homes and commercial buildings of many different types and styles were built to standards typical of American and (less-often) European cities. Other such structures included military fortifications (of types used by both NATO and the Soviet-led Warsaw Pact) and civil-defense as well as "backyard"-type shelters. In such a typical test, several of the same buildings and structures might be built using the same layouts and plans with different types of materials, paints, general landscaping, cleanliness of the surrounding yards, wall-angles or varying distances from ground zero. Mannequins were placed in and around the test vehicles and buildings, aside from some left out in the open, for testing clothing and shock effects. Each of the below ground explosions—some as deep as 5,000 feet (1.5 km)—vaporized a large chamber, leaving a cavity filled with radioactive rubble. About a third of the tests were conducted directly in aquifers, and others were hundreds or thousands of feet below the water table. The Energy Department has 48 monitoring wells at the site, and began drilling nine deep wells in 2009. Because the contaminated water poses no immediate health threat, the department has ranked Nevada as low priority for cleaning up major nuclear weapons sites, and it operates far fewer wells than at most other contaminated sites. In 2009, tritium with a half-life of 12.3 years was first detected in groundwater off-site of the NTS northwest corner in Pahute Mesa, near where the 1968 Benham and 1975 Tybo tests were conducted. Members of Desert Lenten Experience hold a prayer vigil during the Easter period of 1982 at the entrance to the Nevada Test Site. On February 5, 1987, more than 400 people were arrested, when they tried to enter the nation's nuclear proving grounds after nearly 2,000 demonstrators held a rally to protest nuclear weapons testing. Those arrested included the astronomer Carl Sagan and the actors Kris Kristofferson, Martin Sheen, and Robert Blake. Five Democratic members of Congress attended the rally: Thomas J. Downey, Mike Lowry, Jim Bates, Leon E. Panetta, and Barbara Boxer. In the years that followed 1994, Shundahai Network in cooperation with Nevada Desert Experience and Corbin Harney continued the protests of the government's continued nuclear weapons work and also staged efforts to stop a repository for highly radioactive waste adjacent to the test site at Yucca Mountain, 100 mi (160 km) northwest of Las Vegas. Area 23 36°39′34″N 115°59′47″W﻿ / ﻿36.6594°N 115.99642°W﻿ / 36.6594; -115.99642﻿ (Mercury) The base housing and office area for the NTS. Area 1 37°00′29″N 116°03′32″W﻿ / ﻿37.00819°N 116.05894°W﻿ / 37.00819; -116.05894﻿ (U1a) The U1a Complex is an underground laboratory used for physics experiments that obtain technical information about the U.S. nuclear weapons stockpile. U1h and U1g, shafts which add data access, ventilation and other utilities to the facility, are just north of this entrance. Area 1 37°03′56″N 116°08′03″W﻿ / ﻿37.06561°N 116.13411°W﻿ / 37.06561; -116.13411﻿ (Industrial area) Houses $20 million worth of mining tools; contains an area for creating site grout and stemming mixes. Area 5 36°47′53″N 115°56′03″W﻿ / ﻿36.79805°N 115.93416°W﻿ / 36.79805; -115.93416﻿ (Doomtown) The original effects test area and close cousin to Survival City in Area 1. Area 15 37°12′30″N 116°02′25″W﻿ / ﻿37.20829°N 116.04037°W﻿ / 37.20829; -116.04037﻿ (EPA Dairy) A dairy and pig farm maintained from 1964 to 1984 by the EPA, mainly to provide experimental data for uptake of milk contamination, following Operation Schooner. Area 25 36°51′10″N 116°25′36″W﻿ / ﻿36.85282°N 116.42672°W﻿ / 36.85282; -116.42672﻿ (Yucca Mountain) Yucca Mountain radioactive disposal site. This is the north entrance; the south entrance is about 1.7 miles (2.7 km) SSW. Area 16 37°00′45″N 116°11′44″W﻿ / ﻿37.01245°N 116.19565°W﻿ / 37.01245; -116.19565﻿ (A tunnel entrance) Shoshone Mountain, Tunnel A Entrance. Area 12 37°11′36″N 116°11′56″W﻿ / ﻿37.19345°N 116.19887°W﻿ / 37.19345; -116.19887﻿ (B tunnel entrance) Rainier Mesa, Tunnel B Entrance. Area 12 37°11′36″N 116°12′00″W﻿ / ﻿37.19322°N 116.19999°W﻿ / 37.19322; -116.19999﻿ (C, D and F tunnel entrances) Rainier Mesa, tunnels C, D, and F Entrances - separate, but very close together. Area 12 37°11′17″N 116°11′41″W﻿ / ﻿37.18816°N 116.19477°W﻿ / 37.18816; -116.19477﻿ (E tunnel entrance) Rainier Mesa, Tunnel E Entrance. Area 12 37°10′10″N 116°11′41″W﻿ / ﻿37.1694°N 116.1947°W﻿ / 37.1694; -116.1947﻿ (G tunnel entrance) Rainier Mesa, Tunnel G Entrance. Area 12 37°13′08″N 116°09′37″W﻿ / ﻿37.21876°N 116.16036°W﻿ / 37.21876; -116.16036﻿ (I tunnel entrance) Rainier Mesa, Tunnel I Entrance. Area 12 37°13′08″N 116°09′47″W﻿ / ﻿37.21884°N 116.16319°W﻿ / 37.21884; -116.16319﻿ (J tunnel entrance) Rainier Mesa, Tunnel J Entrance. Area 12 37°13′08″N 116°09′32″W﻿ / ﻿37.21878°N 116.15891°W﻿ / 37.21878; -116.15891﻿ (K tunnel entrance) Rainier Mesa, Tunnel K Entrance. Area 12 37°12′06″N 116°11′31″W﻿ / ﻿37.20169°N 116.19187°W﻿ / 37.20169; -116.19187﻿ (N tunnel entrance) Rainier Mesa, Tunnel N Entrance. Area 12 37°13′45″N 116°09′13″W﻿ / ﻿37.22906°N 116.1535°W﻿ / 37.22906; -116.1535﻿ (P tunnel entrance) Rainier Mesa, Tunnel P Entrance. Area 12 37°12′57″N 116°10′02″W﻿ / ﻿37.21589°N 116.16711°W﻿ / 37.21589; -116.16711﻿ (T tunnel entrance) Rainier Mesa, Tunnel T Entrance. Area 25 36°44′44″N 116°19′41″W﻿ / ﻿36.74542°N 116.32816°W﻿ / 36.74542; -116.32816﻿ (X tunnel entrance) Two tunnel entrances, used by the U.S. Army Ballistic Research Laboratory for depleted uranium testing. Area 7 37°04′51″N 116°02′44″W﻿ / ﻿37.0808°N 116.04558°W﻿ / 37.0808; -116.04558﻿ (Icecap) Operation Icecap was being built up when the 1992 Comprehensive Test Ban was signed. The equipment was left in place, including the .5 million pounds (230,000 kg) instrumentation payload, the crane, the wiring, and many of the recording trailers. Area 2 37°08′17″N 116°04′25″W﻿ / ﻿37.13796°N 116.07353°W﻿ / 37.13796; -116.07353﻿ (Gabbs) Operation Gabbs was another shaft detonation scheduled for 1993 that was laid to rest by the '92 test ban treaty. Area 20 37°13′51″N 116°26′50″W﻿ / ﻿37.23086°N 116.44725°W﻿ / 37.23086; -116.44725﻿ (Greenwater) The third suspended test was Operation Greenwater, the test of the space X-Ray laser system, a part of the Star Wars concept. The 45 metres (148 ft) tower remains on the site. It is supposed to be in Area 19, but actually is in 20. Area 1 37°03′11″N 116°06′12″W﻿ / ﻿37.05305°N 116.10339°W﻿ / 37.05305; -116.10339﻿ (Survival City) The alternative to Doomtown. Used in the Teapot Desert/Rock exercises, and the Civil Defence/PR effort Operation Cue. Name taken from "News of the Day" newsreel about the Apple 2 test. Area 1 36°59′13″N 116°02′38″W﻿ / ﻿36.98689°N 116.04384°W﻿ / 36.98689; -116.04384﻿ (Fortune Training Area) Fortune was a training facility for building bomb test sites. Site reused for Unicorn test in 2005–06. Area 16 37°01′21″N 116°10′55″W﻿ / ﻿37.02245°N 116.18203°W﻿ / 37.02245; -116.18203﻿ (U16b tunnel, "Divine Strake") U16b tunnel entrance complex, including Divine Strake proposed 700t chemical blast tunnel on the north, the latter heavily protested, delayed, and eventually abandoned. Area 11 36°58′36″N 115°57′44″W﻿ / ﻿36.97659°N 115.96228°W﻿ / 36.97659; -115.96228﻿ (Plutonium Valley) Area contains scattered raw plutonium from plutonium dispersal safety tests. Area 4 37°05′55″N 116°05′49″W﻿ / ﻿37.09869°N 116.09685°W﻿ / 37.09869; -116.09685﻿ (BREN original placement) Original site of the Bare Reactor Experiment in Nevada (BREN), a reactor on a tower which emulated bomb explosions for medical studies. A Japanese village was constructed around it because it focused on war bomb injuries. BREN was later moved to Area 25. Area 25 36°46′50″N 116°14′37″W﻿ / ﻿36.78062°N 116.24358°W﻿ / 36.78062; -116.24358﻿ (BREN move here) The BREN (Bare Reactor Experiment, Nevada) is a 453 m (1,486 ft) tall tower originally in Yucca Flat, used to experimentally irradiate ground targets with gamma and neutrons. Moved to Jackass Flat, for HENRE (High Energy Neutrons Action Experiment). Demolished 2012-05-23. Area 25 36°49′54″N 116°16′41″W﻿ / ﻿36.83162°N 116.27809°W﻿ / 36.83162; -116.27809﻿ (Nerva test stand) Test stand for the nuclear rocket "Nerva". Area 25 36°49′58″N 116°16′45″W﻿ / ﻿36.83285°N 116.27914°W﻿ / 36.83285; -116.27914﻿ (KIWI-TNT) Test of the Nerva engine to destruction, to determine worst-case scenario for runaway reactor. 1.6 Mci released. Area 6 36°53′54″N 116°02′53″W﻿ / ﻿36.89827°N 116.04814°W﻿ / 36.89827; -116.04814﻿ (DAF) Device Assembly Facility: bombs and components are made ready for testing here. Area 25 36°48′23″N 116°18′17″W﻿ / ﻿36.80646°N 116.30476°W﻿ / 36.80646; -116.30476﻿ (E-MAD) Engine Maintenance and Disassembly Building, used for handling radioactive NERVA engines; site being dismantled. Area 25 36°48′58″N 116°14′22″W﻿ / ﻿36.8161°N 116.23936°W﻿ / 36.8161; -116.23936﻿ (R-MAD) Reactor Maintenance and Disassembly Building, maintained radioactive NERVA reactors. Also used in the MX program; site being dismantled. Area 25 36°49′56″N 116°18′44″W﻿ / ﻿36.8321°N 116.31217°W﻿ / 36.8321; -116.31217﻿ (ETS-1 test stand) Engineering Test Stand 1, a stand for testing nuclear rockets in a standard upright position. Area 27 36°46′30″N 116°07′01″W﻿ / ﻿36.77496°N 116.11703°W﻿ / 36.77496; -116.11703﻿ (JASPER) Houses the Joint Actinide Shock Physics Experimental Research, a two-stage light-gas gun for shock experiments. Area 12 37°11′46″N 116°09′22″W﻿ / ﻿37.19598°N 116.15624°W﻿ / 37.19598; -116.15624﻿ (Camp 12) Camp for miners and others working on the Rainier Mesa in the '70s. Area 3 37°02′40″N 116°01′27″W﻿ / ﻿37.04445°N 116.02425°W﻿ / 37.04445; -116.02425﻿ (RWMS) Low level Radioactive Waste Management Facility. Waste (mostly dirt) is buried in a selection of old subsidence craters. Area 1 37°02′40″N 116°04′26″W﻿ / ﻿37.04434°N 116.07397°W﻿ / 37.04434; -116.07397﻿ (Apple-2 houses) Three "typical American" houses built for the Apple-2 civil defense event. The one on the left is 1.5 miles (2.4 km) from the 29kt blast, the right one 2 miles (3.2 km). The left one is on the monthly tour bus route. The two towers are from later seismic studies. Area 6 36°56′42″N 116°03′00″W﻿ / ﻿36.945°N 116.05°W﻿ / 36.945; -116.05﻿ (News Nob) The location from which VIPs and news people would watch nuclear tests. Area 5 36°42′15″N 115°58′26″W﻿ / ﻿36.70428°N 115.97387°W﻿ / 36.70428; -115.97387﻿ (Annie emplacement) Location of "Atomic Annie" (M65 280mm nuclear field artillery) emplacement for Upshot-Knothole Grable test. Area 12 37°11′44″N 116°09′30″W﻿ / ﻿37.19569°N 116.1584°W﻿ / 37.19569; -116.1584﻿ (BACHUS) Biotechnology Activity Characterization by Unconventional Signatures, a secret biowarfare simulation facility. Area 26 36°49′03″N 116°08′57″W﻿ / ﻿36.81744°N 116.14906°W﻿ / 36.81744; -116.14906﻿ (Project Pluto) Ram-jet nuclear-powered cruise missile engine development project; site being dismantled. Area 6 36°55′37″N 116°00′27″W﻿ / ﻿36.92692°N 116.00755°W﻿ / 36.92692; -116.00755﻿ (AOF - UAV test area) Aerial Operations Facility; a testing area for UAVs. Area 51 37°14′23″N 115°48′49″W﻿ / ﻿37.23986°N 115.81363°W﻿ / 37.23986; -115.81363﻿ (Groom Lake, Area 51) The famed Air Force base used for testing secret aircraft. Area 22 36°37′33″N 116°01′10″W﻿ / ﻿36.62593°N 116.01937°W﻿ / 36.62593; -116.01937﻿ (Camp Desert Rock) The Army Camp that housed the participants in Operations Desert Rock I-VIII. Across the road is the Pig Hilton, where test subjects were housed in barnyard splendor. Area 6 36°56′04″N 116°03′17″W﻿ / ﻿36.93453°N 116.05482°W﻿ / 36.93453; -116.05482﻿ (Test Control Point) NTS Test control center (CP-1). These two buildings controlled the tests performed at the NTS. Area 1 37°03′09″N 116°06′11″W﻿ / ﻿37.05263°N 116.10308°W﻿ / 37.05263; -116.10308﻿ (CTOS) Counter Terrorism Operations Support, a location for training in emergency preparedness in radiological emergencies. Area 27 36°46′45″N 116°06′37″W﻿ / ﻿36.77907°N 116.11041°W﻿ / 36.77907; -116.11041﻿ (Super Kukla) A naked reactor test area designed to test equipment under a hostile radioactive environment, 1965–78. Area 5 36°42′30″N 115°58′27″W﻿ / ﻿36.70843°N 115.97412°W﻿ / 36.70843; -115.97412﻿ (VIP Bleachers) Bleacher area for viewing of Frenchman Flat events. Area 4 37°04′50″N 116°05′13″W﻿ / ﻿37.08068°N 116.08697°W﻿ / 37.08068; -116.08697﻿ (BODF) Buried Objects Detection Facility, area to test and calibrate mine sweeping equipment against buried objects. Area 2 37°08′22″N 116°06′33″W﻿ / ﻿37.13945°N 116.10904°W﻿ / 37.13945; -116.10904﻿ (Gun Turret) Used in calibration of Whitney, Shasta, Diablo and Smoky tests. Made of "old" steel from 1940s U.S. heavy cruiser (USS Louisville CA 28) damaged from kamikaze on January 5, 1945; it was "aimed" at the shot cab to get radiation data. Area 5 36°48′05″N 115°57′03″W﻿ / ﻿36.80138°N 115.95075°W﻿ / 36.80138; -115.95075﻿ (Hazmat Spill Facility) Hazmat Spill Test Facility - used to test Hazmat strategies and tactics. Became the Nonproliferation Test and Evaluation Complex in 2005. Area 5 36°52′29″N 115°55′46″W﻿ / ﻿36.87486°N 115.92957°W﻿ / 36.87486; -115.92957 A massive tracked structure designed to capture neutrons from the Diagonal Line experiment. Area 25 36°41′03″N 116°11′38″W﻿ / ﻿36.68406°N 116.19397°W﻿ / 36.68406; -116.19397﻿ (Rock Valley Study) The circles are the Rock Valley Study Area, environmental research area for studying radiation in the desert ecosystem. Area 15 37°13′25″N 116°03′32″W﻿ / ﻿37.22352°N 116.05895°W﻿ / 37.22352; -116.05895﻿ (Climax Mine) Location of an old silver mine, recycled for three nuclear tests and the Spent Fuel Test in which spent nuclear fuel was stored in a mine drift to study the effects on the granite walls. Area 5 36°45′33″N 115°57′05″W﻿ / ﻿36.75907°N 115.95138°W﻿ / 36.75907; -115.95138﻿ (The Forest) The famous forest on the desert, swept by the blasts of Encore and Grable. St. George, Utah received the brunt of the fallout of above-ground nuclear testing in the Yucca Flats/Nevada Test Site. Winds routinely carried the fallout of these tests directly through St. George and southern Utah. Marked increases in cancers such as leukemia, lymphoma, thyroid cancer, breast cancer, melanoma, bone cancer, brain tumors, and gastrointestinal tract cancers were reported from the mid-1950s through 1980. The Howard Hughes motion picture The Conqueror was being filmed in the area of St. George at the time of the detonation. The fallout is often blamed for the unusually high percentage of cancer deaths among the cast and crew. [citation needed] However, the rates of cancer from that cast and crew (>90 out of 220) were almost identical to the general population, in which 43% may be expected to contract cancer in their lifetimes, and 23% die from it. Nonetheless, there are speculations of a connection. In 1982, a lawsuit brought by nearly 1,200 people accused the government of negligence in atomic and/or nuclear weapons testing at the Nevada Test Site in the 1950s, which they said had caused leukemia and other cancers. Dr. Karl Z. Morgan, Director of Health Physics at Oak Ridge National Laboratory, testified that radiation protection measures in the tests were substandard to what was becoming known of best practices at the time. In a report by the National Cancer Institute, released in 1997, it was determined that ninety atmospheric tests at the Nevada Test Site (NTS) deposited high levels of radioactive iodine-131 (5.5 exabecquerels) across a large portion of the contiguous United States, especially in the years 1952, 1953, 1955, and 1957—doses large enough, they determined, to produce 10,000 to 75,000 cases of thyroid cancer. The Radiation Exposure Compensation Act of 1990 allowed for people living downwind of NTS for at least two years in particular Nevada, Arizona, or Utah counties, between January 21, 1951 and October 31, 1958, or June 30 and July 31, 1962, and suffering from certain cancers or other serious illnesses deemed to have been caused by fallout exposure to receive compensation of $50,000. By January 2006, over 10,500 claims had been approved, and around 3,000 denied, for a total amount of over $525 million in compensation dispensed to "downwinders". By May 2014, the numbers of claims approved had reached 28,880, for a total compensation of $1.9 billion. Additionally, the Energy Employees Occupational Illness Compensation Program Act of 2000 provides compensation and medical benefits for nuclear weapons workers who may have developed certain work-related illnesses. Uranium miners, mill workers, and ore transporters are also eligible for $100,000 compassionate payment under the Radiation Exposure Compensation Program, while $75,000 is the fixed payment amount for workers who were participants in the above-ground nuclear weapons tests. Area 1 held eight nuclear tests for a total of nine detonations. Four early atmospheric tests were conducted above Area 1 in the early 1950s, as well as three underground tests in 1971 and 1990. In 1955, a Civil Defense experiment (called Operation Cue in the press) studied nuclear blast effects on various building types; a few structures still stand. The radioactivity present on the ground in Area 1 provides a radiologically contaminated environment for the training of first responders. Area 2 is a division of the Nevada Test Site in the Mojave Desert. The area is located 18 miles south-west of Area 51. As part of Operation Tinderbox, on June 24, 1980, a small satellite prototype (DSCS III) was subjected to radioactivity from the "Huron King" shot in a vertical line-of-sight (VLOS) test undertaken in Area 3. This was a program to improve the database on nuclear hardening design techniques for defense satellites. The final nuclear test detonation at Nevada Test Site was Operation Julin's "Divider" on September 23, 1992, just prior to the moratorium temporarily ending all nuclear testing. Divider was a safety experiment test shot that was detonated at the bottom of a shaft sunk into Area 3. In 1995 and 1997, plutonium-contaminated soil from "Double Tracks" and "Clean Slate 1" of Operation Roller Coaster (1963) was picked up from the Tonopah Test Range and brought to the Area 3 Radioactive Waste Management Site as a first step in eventually returning Tonopah Test Range to an environmentally neutral state. Corrective action regarding the contaminated material from the "Clean Slate 2" and "Clean Slate 3" tests has yet to be agreed upon. Area 5 held 19 nuclear tests. Five atmospheric tests were detonated, starting on January 27, 1951 at Area 5 as part of Operation Ranger. These were the first nuclear tests at NTS. Further tower detonations were studied at Area 5, and the Grable shot which was fired from a M65 Atomic Cannon located in Area 11 exploded in Area 5. The Priscilla test was conducted at Area 5 on June 24, 1957. Five underground tests were set up at Area 5; four of those suffered accidental release of radioactive materials. On March 16, 1968, physicist Glenn T. Seaborg toured the upcoming Milk Shake shot of Operation Crosstie. Milk Shake's radioactive release was not detected outside of NTS boundaries. In 1982, while a live nuclear bomb was being lowered underground, the base came under attack by armed combatants. The combatants turned out to be a security team conducting an improperly scheduled drill. During Operation Buster, four successful tests were conducted via airdrop, with bomber aircraft releasing nuclear weapons over Area 7. Area 8 hosted the "Baneberry" shot of Operation Emery on December 18, 1970. The Baneberry 10 kt (42 TJ) test detonated 900 feet (270 m) below the surface but its energy cracked the soil in unexpected ways, causing a fissure near ground zero and the failure of the shaft stemming and cap. A plume of fire and dust was released, raining fallout on workers in different locations within NTS. The radioactive plume released 6.7 megacuries (250 PBq) of radioactive material, including 80 kCi (3.0 PBq) of Iodine131. In Area 9, the 74 kt (310 TJ) "Hood" test on July 5, 1957, part of Operation Plumbbob, was the largest atmospheric test ever conducted within the continental United States; nearly five times larger in yield than the bomb dropped on Hiroshima. A balloon carried Hood up to 460 meters above the ground where it was detonated. Over 2,000 troops took part in the test in order to train them in conducting operations on the nuclear battlefield. 11 megacuries (410 PBq) of iodine-131 (131I) were released into the air. The first underground test at NTS was the "Uncle" shot of Operation Jangle. Uncle detonated on November 29, 1951 within a shaft sunk into Area 10. The "John" shot of Plumbbob, on July 19, 1957, was the first test firing of the nuclear-tipped AIR-2 Genie air-to-air rocket designed to destroy incoming enemy bombers with a nuclear explosion. The 2 kt (8.4 TJ) warhead exploded approximately three miles above five volunteers and a photographer who stood unprotected at "ground zero" in Area 10 to show the apparent safety of battlefield nuclear weapons to personnel on the ground. The test also demonstrated the ability of a fighter aircraft to deliver a nuclear-tipped rocket and avoid being destroyed in the process. A Northrop F-89J fired the rocket. The "Sedan" test of Operation Storax on July 6, 1962, a 104 kt (440 TJ) shot for the Operation Plowshare which sought to discover whether nuclear weapons could be used for peaceful means in creating lakes, bays or canals. The explosion displaced twelve million tons of earth, creating the Sedan crater which is 1,280 feet (390 m) wide and 320 feet (100 m) deep. Area 11 held 9 nuclear tests. Four of the tests were weapons safety experiments conducted as Project 56; they spread so much harmful radioactive material around the test sites that Area 11 has been called "Plutonium Valley". As is the case with Area 1, background radiation levels make Area 11 suitable for realistic training in methods of radiation detection. 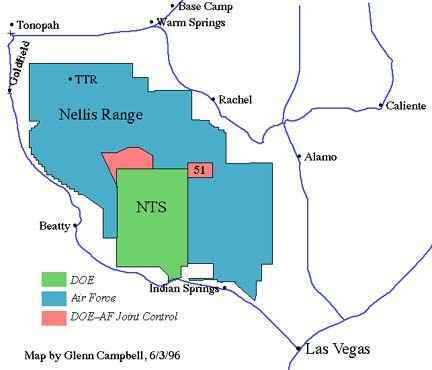 There is no Area 13 within NNSS, though such a name is attached to a section of Nellis Air Force Range which abuts the northeastern corner of Area 15. Project 57's weapons safety test was conducted here on April 24, 1957, spreading particles emitting alpha radiation over a large area. Pile Driver was a notable Department of Defense test. A large underground installation was built to study the survivability of hardened underground bunkers undergoing a nuclear attack. Information from the test was used in designing hardened missile silos and the North American Aerospace Defense Command facility in Colorado Springs. From 1964 to 1981, the Environmental Protection Agency operated a 36-acre (150,000 m2) experimental farm in Area 15. Extensive plant and soil studies evaluated the uptake of pollutants in farm-grown vegetables and from the forage eaten by a dairy herd of some 30 Holstein cows. Scientists also studied horses, pigs, goats, and chickens. Area 18 held five nuclear tests. and includes the Pahute Mesa Airstrip. A total of 85 nuclear tests were conducted in Pahute Mesa between 1965 and 1992. Three of them — Boxcar, Benham and Handley — had a yield of over one megaton. Three tests were conducted as part of Operation Plowshare and one as part of Vela Uniform. No nuclear tests took place in Area 22. Area 22 once held Camp Desert Rock, a staging base for troops undergoing atmospheric nuclear blast training; as many as 9,000 troops were camped there in 1955. Desert Rock Airport's runway was enlarged to a 7,500 ft (2,300 m) length in 1969 by the Atomic Energy Commission. It is a transport hub for personnel and supplies going to NNSS and also serves as an emergency landing strip. No nuclear tests took place in Area 23. The town of Mercury, Nevada lies within Area 23. The area is the main pathway to and from NNSS test locations by way of U.S. Route 95. An open sanitary landfill is located to the west of Mercury, and a closed hazardous waste site abuts the landfill. Mercury is also the main management area for the site which includes a bar and large cafeteria, printing plant, medical center, warehousing, fleet management, liquidation and recycling center, engineering offices, dormitories, and other administrative areas for both the O&M contractors, LLNL, LANL, and SNL personnel. At its height in the 1950s and '60s it also held several restaurants, a bowling alley, a movie theater, and a motel. In 1983 the Department of Defense, the Department of Energy, and the Federal Emergency Management Agency performed the NUWAX-83 tests near Port Gaston in Area 26, simulating the explosion of a nuclear-armed helicopter and the resulting spread of nuclear debris over 65 acres. The radioactive material used to simulate the accident became inert in less than six months. An eight-square-mile complex was constructed in Area 26 in support of Project Pluto. It consisted of six miles of roads, the critical assembly building, the control building, the assembly and shop buildings, and utilities. Those buildings have been used recently as mock reactor facilities in the training of first responders. Area 30 was the site of a single nuclear test, the Crosstie Buggy row charge experiment, part of Operation Plowshare, which involved five simultaneous detonations. ^ "Nevada nuclear bomb site given new name". United Press International. August 23, 2010. Retrieved August 23, 2010. ^ "Nevada Test Site north of Las Vegas gets new name: Nevada National Security Site, or N2S2". March 20, 2015. ^ a b Johnson, Carl (1984). "Cancer Incidence in an Area of Radioactive Fallout Downwind From the Nevada Test Site". Journal of the American Medical Association. 251 (2): 230. doi:10.1001/jama.1984.03340260034023. ^ "Nevada National Security Site". NNSS. Retrieved May 25, 2018. ^ Frank von Hippel (December 14, 2012). "Subcritical experiments". Bulletin of the Atomic Scientists. Retrieved November 26, 2014. ^ PAUL ROUPE (December 3, 2018). "Nevada Balks at Feds' Plan to Store Plutonium Near Vegas". Courthouse News. ^ a b c Ralph Vartabedian. Nuclear scars: Tainted water runs beneath Nevada desert Los Angeles Times, November 13, 2009. ^ a b Keith Rogers (November 19, 2014). "Report: Nuclear testing remnants remain radioactive". Las Vegas Review Jour. Stephens Media LLC. Retrieved November 26, 2014. ^ Political protest and cultural revolution By Barbara Epstein p. 165. ^ "Nevada Test Site Guide" (PDF). DOE/NV-715 Rev 1. National Nuclear Security Administration. 2005. Archived from the original (PDF) on February 27, 2013. Retrieved December 25, 2013. ^ Meeting Dirty Harry in 1953 Archived June 18, 2013, at the Wayback Machine. Chester McQueary, CommonDreams.org. ^ Pat Ortmeyer and Arjun Makhijani. "Let Them Drink Milk," The Bulletin of the Atomic Scientists, November/December 1997, via IEER Archived April 13, 2012, at the Wayback Machine. Retrieved October 31, 2007. ^ Office of Compensation Analysis and Support. National Institute for Occupational Safety and Health. ^ a b United States Geological Survey. Nevada Test Site. Geologic Surface Effects of Underground Nuclear Testing. Accessed on April 18, 2009. ^ Gross, Daniel A. (2016). "An Aging Army". Distillations. 2 (1): 26–36. Retrieved March 20, 2018. ^ a b National Nuclear Security Administration / Nevada Site Office (April 2010). "Plutonium Dispersal Tests at the Nevada Test Site" (PDF). Fact Sheets. Archived from the original (PDF) on September 27, 2011. Retrieved December 2, 2011. ^ Rogers, Keith (March 5, 2016). "You know Area 51, but just what in the world is Area 6?". Las Vegas Review-Journal. Retrieved March 5, 2016. ^ National Nuclear Security Administration / Nevada Site Office (January 2011). "Icecap" (PDF). Fact Sheets. Archived from the original (PDF) on September 27, 2011. Retrieved December 2, 2011. ^ "Operation PLUMBBOB. Summary Report, Test Group 57, Nevada Test Site". DEFENSE NUCLEAR AGENCY. October 10, 1958. Archived from the original on August 23, 2011. Retrieved December 18, 2010. ^ Associated Press (May 6, 1983). "Nevada, US Simulate Nuclear Accident". Lakeland Ledger. Retrieved May 13, 2015. ^ National Nuclear Security Administration / Nevada Site Office (April 2010). "Project Pluto" (PDF). Fact Sheets. Archived from the original (PDF) on March 3, 2012. Retrieved December 2, 2011. Wikimedia Commons has media related to Nevada Test Site. Atomic Test Effects In The Nevada Test Site Region published by the AEC in 1955, a document with a civilian audience in mind. Historic American Engineering Record (HAER) No. NV-25, "Nevada Test Site, Engine Maintenance Assembly & Disassembly Facility, Area 25, Jackass Flats, Mercury, Nye County, NV"
HAER No. NV-26-A, "Nevada Test Site, Reactor Maintenance & Disassembly Complex, Junior Hot Cell, Jackass Flats, Area 25, South of intersection of Roads F & G, Mercury, Nye County, NV"
HAER No. NV-27, "Nevada Test Site, Japanese Village, Area 4, Yucca Flat, 4-04 Road near Rainier Mesa Road, Mercury, Nye County, NV"
HAER No. NV-27-A, "Nevada Test Site, Japanese Village, Type B Structure"
HAER No. NV-27-B, "Nevada Test Site, Japanese Village, Type C Structure"
HAER No. NV-27-C, "Nevada Test Site, Japanese Village, Type C Elevation"
HAER No. NV-28, "Nevada Test Site, Environmental Protection Agency Farm, Area 15, Yucca Flat, 10-2 Road near Circle Road, Mercury, Nye County, NV"
HAER No. NV-28-A, "Nevada Test Site, Environmental Protection Agency Farm, Laboratory Building"
HAER No. NV-28-B, "Nevada Test Site, Environmental Protection Agency Farm, Storage Shed"
HAER No. NV-28-C, "Nevada Test Site, Environmental Protection Agency Farm, Silo Type"
HAER No. NV-28-D, "Nevada Test Site, Environmental Protection Agency Farm, Quonset Hut Type"
HAER No. NV-28-E, "Nevada Test Site, Environmental Protection Agency Farm, Shelter Unit Type"
HAER No. NV-28-F, "Nevada Test Site, Environmental Protection Agency Farm, Weather Tower"
HAER No. NV-28-G, "Nevada Test Site, Environmental Protection Agency Farm, Power Substation"
HAER No. NV-29-A, "Nevada Test Site, Reactor Maintenance Assembly & Dissassembly Facility, Area 25, Jackass Flats, Junction of Roads F & G, Mercury, Nye County, NV"
HAER No. NV-30-A, "Nevada Test Site, Test Cell C Facility, Building No. 3210, Area 25, Jackass Flats, Road J, Mercury, Nye County, NV"
HAER No. NV-30-B, "Nevada Test Site, Test Cell C Facility, Elevated Water Tower"
HAER No. NV-30-C, "Nevada Test Site, Test Cell C Facility, West Camera Bunker"
HAER No. NV-31, "Nevada Test Site, Super Kukla Facility, Area 27, Rock Valley, South of Cane Spring Road, Mercury, Nye County, NV"
HAER No. NV-31-A, "Nevada Test Site, Super Kukla Facility, Containment Building"
HAER No. NV-31-B, "Nevada Test Site, Super Kukla Facility, High Bay"
HAER No. NV-32, "Nevada Test Site, Pluto Facility, Area 26, Wahmonie Flats, Cane Spring Road, Mercury vicinity, Nye County, NV"
HAER No. NV-32-A, "Nevada Test Site, Pluto Facility, Disassembly Building"
HAER No. NV-32-B, "Nevada Test Site, Pluto Facility, Guard House"
HAER No. NV-32-C, "Nevada Test Site, Pluto Facility, Water Filtering System Brock House"
HAER No. NV-32-D, "Nevada Test Site, Pluto Facility, Water Tower"
HAER No. NV-32-E, "Nevada Test Site, Pluto Facility, Test Car Wash Stand"
HAER No. NV-33, "Nevada Test Site, Test Cell A Facility, Area 25, Jackass Flats, Road F, Mercury, Nye County, NV"
HAER No. NV-33-A, "Nevada Test Site, Test Cell A Facility, Test Cell A Building & Addition"
HAER No. NV-33-B, "Nevada Test Site, Test Cell A Facility, Tunnel"
HAER No. NV-33-C, "Nevada Test Site, Test Cell A Facility, Spherical Dewar"
HAER No. NV-33-D, "Nevada Test Site, Test Cell A Facility, Moveable Shed"
HAER No. NV-33-E, "Nevada Test Site, Test Cell A Facility, Bunker"
HAER No. NV-37-A, "Nevada Test Site, Frenchman Flat Test Facility, Main Switching Bunker, Intersection of 5-03 Road & Short Pole Line Road, Area 5, Frenchman Flat, Mercury, Nye County, NV"
HAER No. NV-37-B, "Nevada Test Site, Frenchman Flat Test Facility, Well Five Booster Stations"